There is abundant wildlife all around us. At my parents' home we have observed these turtles for years, oftentimes on the driveway in the early morning after a rainy night. 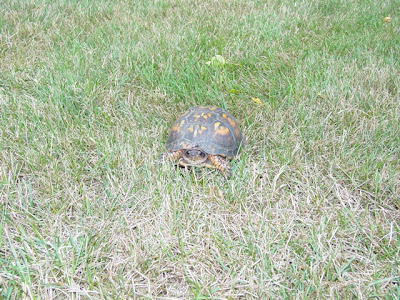 We were sitting on the back porch Saturday and noticed something moving (slowly) across the lawn. The kids and I went to investigate and I snapped a few pictures of this Eastern Box Turtle (Terrapene carolina carolina). 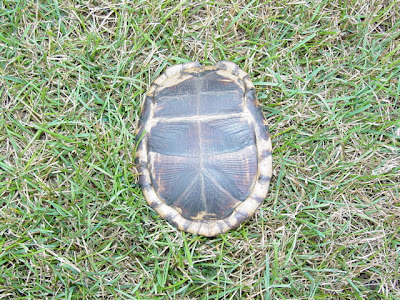 These turtles are protected in Massachusetts from collection in the wild and you are not allowed to keep them as pets. How this could ever be enforced, I don't know; the turtle police are way underfunded in my community! Regardless, we observed him (her?) 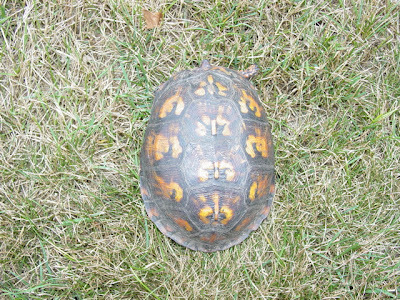 for a while and then moved him to the underbrush in the "out of bounds area" for our dog. Dogs can do a real number on turtles. 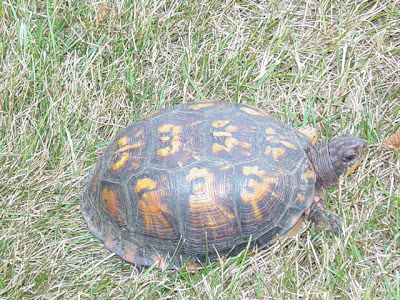 Enjoy the pictures of this turtle you might not get to see in your backyard!